At the Dillingham Middle School, President Obama was treated to a youth cultural dance performance. The grade-scool-aged children performed four Yup’ik dances. The Yup’ik are Inuit people and they live in Southwestern Alaska..
Obama sat on the front row, grinning throughout the performance and clapping appreciatively. Sonny Black Eagle (President Obama’s adoptive Crow father, who has passed) would have loved to witness these Yup’ik dances. Obama jumped up and danced with the children during the last song. “I’ve been practicing,” he said. Clearly the president had taken a crash course on the routine. 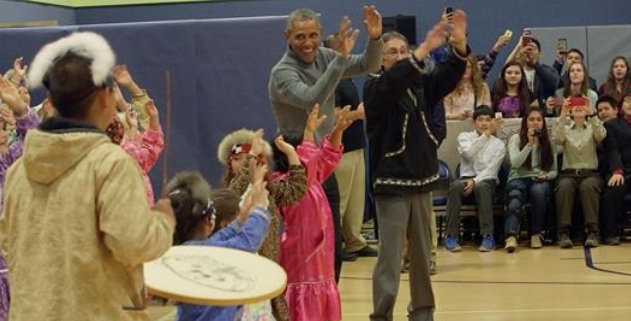 Responses to "President Obama Do a Yup’ik Dance With Native Alaskan Kids"
It's qo derful. Good to see.